Gull 2853. Many extras included. Light blue hull. Made by Hartley boats in 2012. This is the Calypso model which has a lot of cockpit space and a huge storage locker. Nice stable boat so would suit beginner as well as experienced sailors. Must be seen. 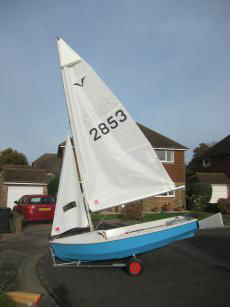 A really nice boat that I am only (reluctantly) selling due to health reasons and house move. Bought new for about £6,000.